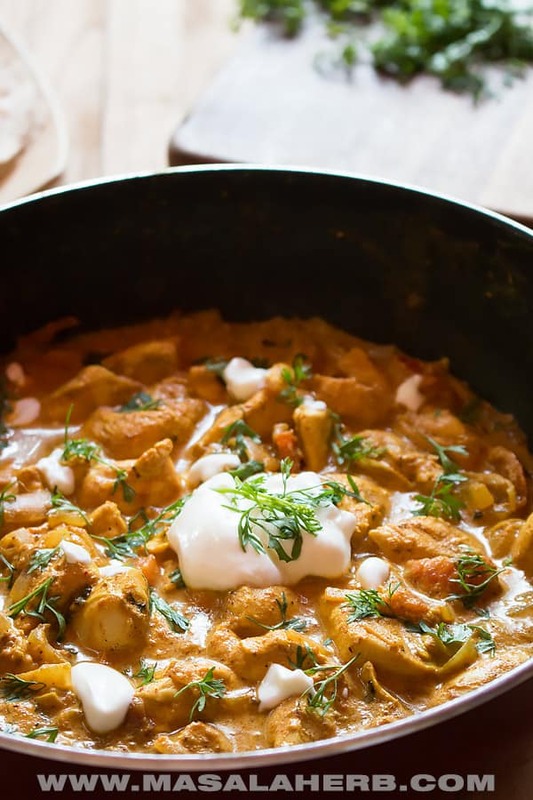 I think this is the best chicken balti recipe that you can make at home from scratch with fresh ingredients, quickly, easily and in only one pot! 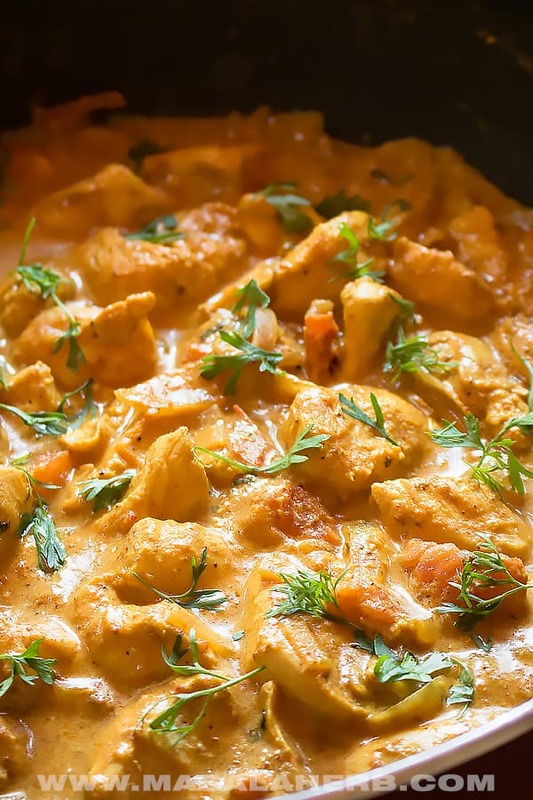 Makes a satisfying and flavorful chicken balti weeknight meal. Chicken Balti is a popular British Curry prepared and served in a so-called Balti pan. That’s how chicken balti got its name, from the special pan it’s cooked in. A Balti dish is a shallow pressed cast iron pan. Ultimately it’s almost the same as a karahi/kadhai pan, just that the latter has a copper bottom. Balti pans are used in and around the regions of Pakistan. According to the wiki, the name came from a region called Baltistan in Pakistan and or maybe even from the ethnic Balti minority (Tibetan Muslims). 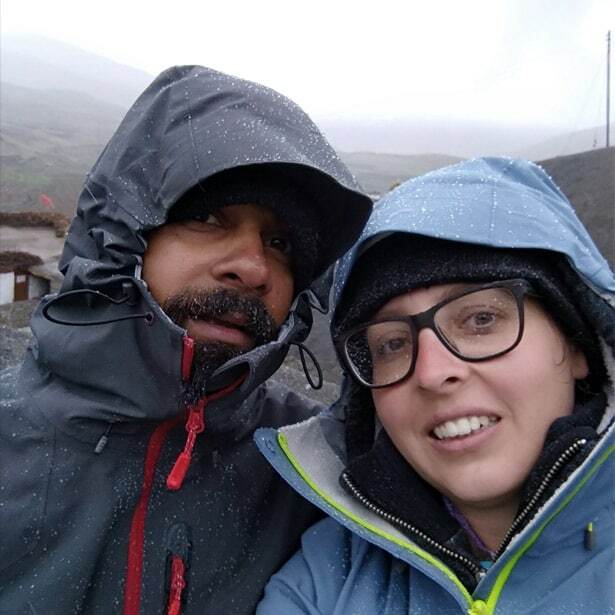 Where did chicken balti originate? So people will argue over this one. Some claim that the chicken balti was prepared in Pakistan, others say it came into existence in Birmingham, UK. Currently, in Pakistan and India, you will be able to find a dish called Balti Gosht. Gosht means read meat in general. Eventually, somebody made a chicken boneless version of the traditional balti gosh dish and added a twist to it and called it a Chicken Balti. So I think it’s just fair to call the chicken balti a British curry. I have never seen a chicken balti in India, it was inspired by a Pakistani/Indian dish but that’s about it. We can see a similar case arising from dishes such as Chicken Tikka Masala (similar to Chicken Tikka and Butter Chicken) and Mulligatawny soup (related to the south Indian Pepper soup). These are dishes which evolved and transcend borders due to the history of regions and their association with each other. The beauty of such dishes is that ingredients can be adjusted and that there are no fixed rules, which makes them more attractive and ever-evolving towards perfection! To make the best Chicken Balti from scratch you will need various quality fresh ingredients. Each ingredient has its own purpose in building up this popular British curry. The base of a chicken balti curry sauce, besides the spices, is made of Onion, Tomato, Ginger garlic, and cream. The Onion lends the curry the comforting flavor, the tomato thickens the curry besides lending the spiced sauce a slight pleasing sour touch to it. The ginger and garlic round up the curry and help in thickening the sauce as well. Ginger in form of a powder, or even better a paste, has thickening properties and together with garlic in form of a paste, thickens any curry all the more. Besides these ingredients, we will be adding some tomato paste and cream to build up more sauce and to thicken the curry further. Usually, yogurt is added to the curry while cooking. I decided to add a dollop of yogurt while serving up the chicken balti. The reason for that is simple. 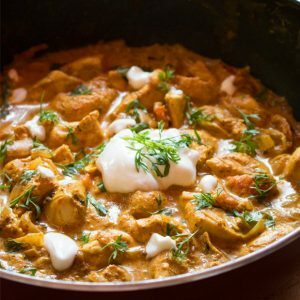 Besides, yogurt has a tendency to curdle on high heat and to make this curry super easy but flavorful to the point, I decided that you would be better off adding the thick greek yogurt style curd while serving up the chicken balti. Also, thick Yogurt has a tendency to change flavor while cooking, I want to preserve the Nobel first flavors of the yogurt in this balti dish. To give it that creamy pure acid flavor, which I personally crave for in a good homemade curry. For the chicken, you can use boneless breast or leg. Try to pick only A grade chicken for the best possible chicken balti experience. Better quality chicken costs a little more but makes all the difference in a chicken balti dish. Yet, poor quality chicken can turn chewy quickly during the cooking process and doesn’t add the flavors you are used to from your local curry house. The rule of thumb applies here, quality over quantity. The choice of spices, the quality of spices and the right amount will be the deciding factor to create the best chicken balti curry. When possible try to use whole spices or even better whole spices toasted and ground freshly into a powder. I am saying the second is better because the flavors tend to be more equally spread in the curry. Besides, fishing out whole spices is not my favorite thing to do after the cooking process. However, I am not going to judge if you use ready-made ground spices. It’s just more convenient that way and can save you a lot of time and the curry does taste amazing that way too. Convenience is ok too! If you have time and you want the maximum flavor in your chicken balti, use whole spices, toast the spices, let cool, grind in a stone mortar and pestle with the freshly chopped ginger and garlic and add to the curry. In the case of Garam Masala, you will be better off using a store-bought version of a trusted brand (Everest Garam Masala turns out the best choice). 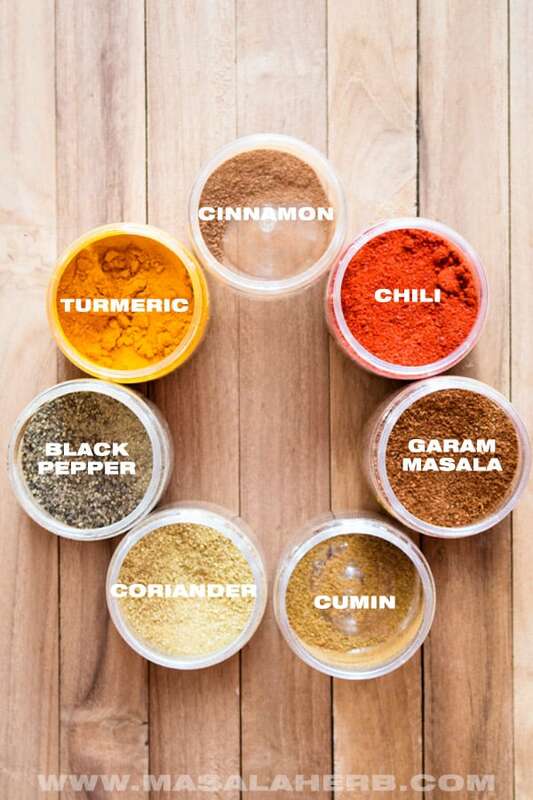 Garam Masala is one of those spice blends which prepared from scratch will taste different when homemade. That’s why get a reliable Garam Masala brand, I use this one always, it works for all meals. Besides preparing garam masala from scratch is most of the time, not an option, ultimately because the garam masala spice blend recipe calls for black cardamom seeds. Those are usually hard to come by. Dried Fenugreek leaves (aka Kasuri Methi) is a wonderful strongly flavored herb which enhances a chicken curry with deep flavors. Fenugreek leaves in a dried variation is an optional ingredient in the chicken balti and a little insider tip. You don’t always find dried fenugreek leaves in stores and it’s an ingredient which I personally rarely use, in fact, I only use it for north Indian meals such as Tandoori chicken. A Facebook follower asked why I hadn’t added dried fenugreek leaves to the list of ingredients in my oven baked chicken tandoori, so I decided to leave it up to you in this chicken balti recipe, by at least mentioning the option of dried fenugreek as a great curry flavor addition! How to make Chicken Balti? To make chicken balti from scratch is actually super easy! Start by adding oil to a shallow pan. Try to use a Balti or Indian Kadhai pan, another option is to use a shallow wok. Add your sliced onion and stir-fry/cook soft. Then continue to add diced tomato bits and ginger garlic as a paste or chopped fine. Next stir fry the contents on medium to high heat before turning down the heat again so that you get the time to add all your spices. Stir fry on slow to medium heat so that the spices will get a bit cooked. You will notice a pleasant spiced aroma taking over the room. Then, in goes the cubed boneless chicken, dried fenugreek leaves (optional), tomato paste and cream. In the end, you are only left with adding some water, so that you have some more sauce in your curry and not just chicken and season with salt to taste if you want (not always necessary). Let the curry cook on slow to medium heat until the chicken is cooked but not overcooked chewy. Keep an eye on it. This should take about 10 minutes. To serve you can leave the curry in the shallow pan, to mimic the balti spirit! Add a dollop or two of Greek-style thick yogurt to the curry and sprinkle with freshly chopped cilantro/coriander leaves. How to store chicken balti? 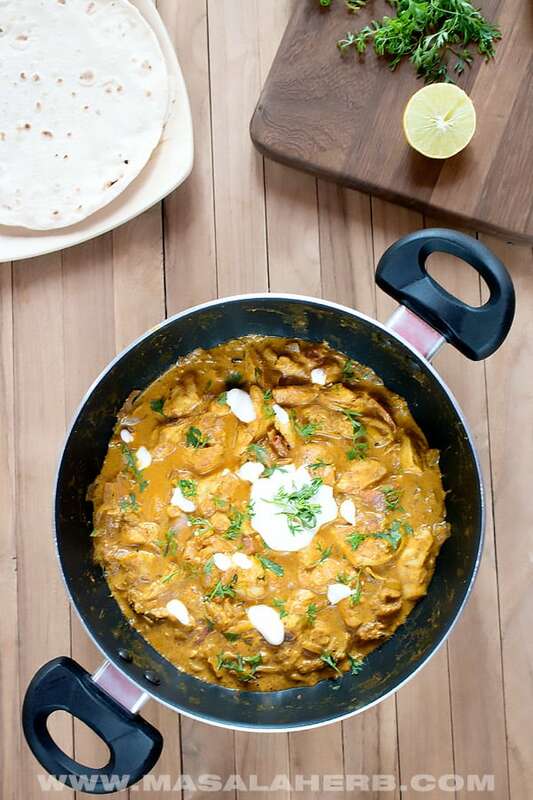 You can double the chicken balti recipe and store the remaining curry in your fridge. In fact, chicken balti makes a great meal prep dish for the week. To meal prep chicken balti add the curry into small batch meal prep containers. Hence, chicken Balti (as any curry) tastes usually better after having been in the fridge and warmed up again. The chicken sitting around in the spices curry sauce is your flavor advantage. How to and for how long can I store chicken balti in the fridge? Store the chicken balti up to 3-4 days in the fridge in an airtight container. If you store it any longer the chicken balti might get spoiled or will taste dry and off. Can I freeze Chicken Balti? Yes! You can freeze the chicken balti in batches in airtight containers for a longer period than in the fridge. To reheat, just keep to defrost first and heat the chicken balti again in a pot on the stove or in the microwave (low setting or the chicken gets chewy). Chicken Balti is a flavorful creamy one-pot curry, which is associated with British curry culture. Richly spiced and enhanced with quality ingredients, this quickly turns out to be the best homemade chicken balti! This Chicken Balti is gluten-free if used with gluten-free spices (see what the package mentions on the spice). Serving suggestions below the recipe card in the post. Grab your pan and heat up the oil, add your sliced onion. Stir fry and cook soft, then add the diced tomato. Cook the tomato soft on medium to high heat. Then reduce the heat and add the ginger garlic paste (or chopped ginger and garlic). Then add the spices all at once. turmeric, chili, cumin, coriander, cinnamon, black pepper, garam masala and stir-fry for a minute or two. Now add your pre-cut chicken cubes and stir-fry for another minute on high heat before taking down the heat to slow/medium again. This helps the chicken flavors going! Then add the tomato paste and cream, mix and stir cook for another minute on medium heat before pouring in the water. Mix all the content well and let cook on slow to medium heat so that the chicken kind of poaches slowly in the spiced curry sauce. Make sure to not turn up the heat too much as this may break down the curry and curdle and high heat can turn the chicken chewy and you don't want that. So cook the chicken until it's cooked through, juicy but done. That usually take around 10-15 minutes. Take from the heat and serve the chicken balti in the shallow pan. Garnish with a dollop or two of greek yogurt style thick curd, sprinkle some lime juice if you want and some freshly cut cilantro/coriander leaves. Enjoy still hot. To make the BEST chicken balti use only A grade chicken boneless breast or legs, fresh cream, yogurt, tomato paste. Including toast and grind quality spices in a stone mortar. To make a quick and easy weeknight chicken balti use ready-made ingredients such as packet garam masala. How to serve Chicken Balti? Dear Reader, how did you come to know about Chicken Balti? Is it common in your area? Please, feel free to share your point of view further below in the comment section. 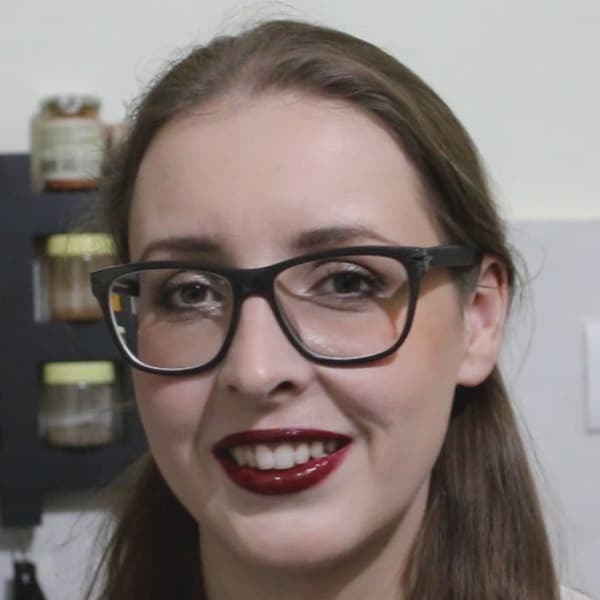 The Video appears under the title “How to make Chicken Balti”, which is situated after the 3rd photograph. Hi, this may be interesting you: BEST Chicken Balti Recipe!